WASHINGTON — The nation’s respite from troublesome health care inflation is ending, the government said Wednesday in a report that renews a crucial budget challenge for lawmakers, taxpayers, businesses and patients. 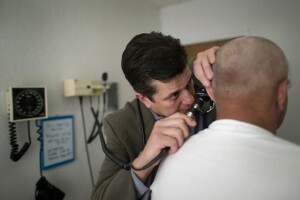 Economic recovery, an aging society and more people insured under the new health care law are driving the long-term trend. Projections by nonpartisan experts with the Health and Human Services department indicate the pace of health care spending will pick up starting this year and beyond. The introduction of expensive new drugs for the liver-wasting disease hepatitis C also contributes to the speed-up in the short run. The report from the Office of the Actuary projects that spending will grow by an average of 6 percent a year from 2015-2023. That’s a notable acceleration after five consecutive years, through 2013, of annual growth below 4 percent. Although the coming bout of health-cost inflation is not expected to be as aggressive as in the 1980s and 1990s, it will still pose a dilemma for President Barack Obama’s successor. Long term, much of the growth comes from Medicare and Medicaid, two giant government programs now covering more than 100 million people. The United States is expected to spend more than $3 trillion on health care this year, far above any other economically advanced country. Yet Americans are not appreciably healthier, and much what they spend appears to go for tests and treatments of questionable value. Fraud also siphons off tens of billions of dollars a year. Because health care spending is so high, shifts of a couple of percentage points have significant economic consequences. Health care inflation has recently been in line with overall economic growth, keeping things manageable. As spending rebounds, health care again will start consuming a growing share of the economic pie, crowding out other worthy priorities. From 17.2 percent of the economy in 2012, health care is expected to grow to a 19.3 percent share by 2023, the report said. “The period in which health care has accounted for a stable share of economic output is expected to end in 2014, primarily because of the (health care law’s) coverage expansions,” it concluded. Yet if Obama’s Affordable Care Act is an immediate trigger for rising costs, the analysts who produced the report said it is not the only factor. It’s probably not the most important one when placed next to a recovering economy and an aging population. Traditionally, the state of the economy has been the strongest driver of health care spending. The report estimated that 9 million uninsured people gained coverage this year as the health care law’s big coverage expansion got underway, and another 8 million will be added next year. More people insured translates into higher demand for medical services and more spending, so White House claims of dramatic savings from the health law were always suspect. But the fiscal doomsday warnings from “Obamacare” detractors have not materialized, either. Part of the reason seems to be a push-and-pull effect within the health overhaul. Obama’s insurance expansion increases spending, but Medicare cuts under the same law help keep other costs down. And Congress reinforced Obama’s Medicare cuts with a round of its own during recent budget battles. The analysts said they did not see much evidence that payment reforms encouraged by the health law are having an impact on costs yet. Medicare is experimenting with how it pays hospitals and doctors to reward efficiency while maintaining or improving quality. The White House may take comfort that the report does not foresee a return to inflation rates of 7 percent a year or more. “We are not projecting that growth will get back to its rapid pace of the ’80s and ’90s,” said Sean Keehan, a senior economist who worked on the report. Again, factors other than the health care law seem to be involved. For example, employers have significantly increased deductibles and copayments, so working families must pay more out of their own pockets when they use medical care. The report was published online by the journal Health Affairs. — Medicare and Medicaid will drive costs from 2016-2013, with average annual increases of 7.3 percent and 6.8 percent respectively. For Medicare, it’s partly due to the retirement of the baby-boom generation, while Medicaid will see higher use of services by elderly and disabled beneficiaries. — The federal, state and local government share of health care spending will keep steadily rising, from 44 percent in 2012 to 49 percent in 2023. The share of costs covered by businesses will decline from 21 percent to 19 percent.